If you plan to fly to your vacation destination, your airline ticket represents a big chunk of your travel expenses. Instead of spending your time clicking around various airlines’ websites for the best deal, let a search engine like Kayak.com do the work for you. It checks other sites in seconds and compares prices across various airlines, quickly finding the cheapest deal for when you plan to fly. This is another site that scours multiple sites for the best flight deals. What’s extra helpful about Skyscanner.com is that if you have flexible travel dates, you can view a “show whole month” feature that lets you quickly scan for the cheapest outbound and return dates of travel for any destination. Staying in hotels while traveling can get pricey! Consider Airbnb instead. Airbnb lets you book a room in someone’s home or their entire apartment or house at a price that is often far cheaper than a hotel stay. This site even has unique, one-of-a-kind accommodations like tree houses and yurts, giving you plenty of options that go beyond the standard tourist experience. You can even take advantage of completely free accommodations by connecting with like-minded travelers as a member of Couchsurfing.com. Couchsurfers are a community of people in cities around the world who open their homes (and couches!) to other travelers without charging a dime, giving you the chance to live like a local and make new friends. If you have ever used Groupon to find a great deal on a meal out or local activity, you already know that this site offers some unbelievable bargains. The same is true for their travel offers! The “Getaways” section of this online coupon site features weekend deals, discounted hotels, all-inclusive packages, and even international travel. It doesn’t get much cheaper than Groupon, so be sure to check it out before you plan your next holiday trip! We all need a vacation now and then; we encourage you to take advantage of your trip to the U.S. to explore its different destinations! 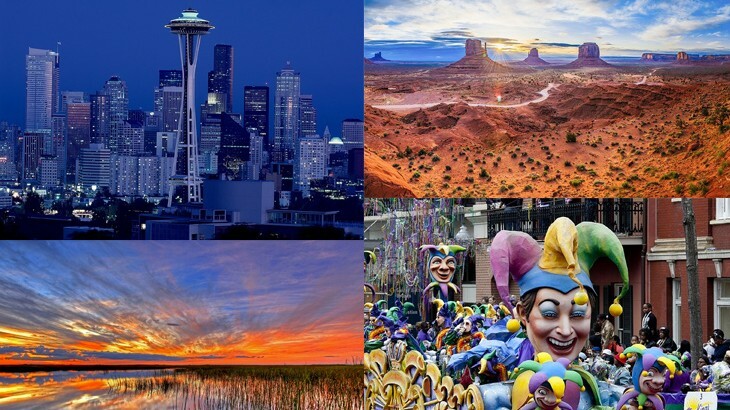 Don’t let budget stop you from exploring the USA! Check out our guide to renting a car in the U.S.
esl-blog, Extracurricular Activities, General Info, Top Five. permalink.